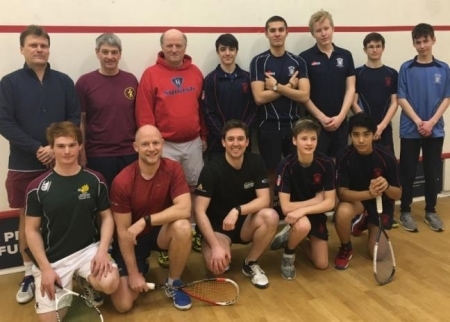 The inaugural Merchistonian v Merchiston squash match took place on 8 March at Colinton Castle Squash Club. The match was initiated by Andrew Duff (76-79) and Jim Hay, President of Scottish Squash. Andrew coordinated bringing together six Merchistonians from a range of eras. Merchiston players were members of the U19 and U16 teams. An informal arrangement for the match was arranged with one set being played between players from each side. Whilst there were a few tight matches the Merchistonians’ experience showed, with Merchistonians winning the majority of the games. However current Merchiston number one player David T won all three of his matches with relative ease. Following the success of this fixture it is anticipated this will become a regular on the Merchistonian Squash Club fixture list. If you would like to get in touch with the squash section please get in touch.